The Round II match schedule of the Singer Schools Under-19 League Rugby Championship was released by the Sri Lanka Schools Rugby Football Association (SLSRFA) with the kickoff date set for April 20. A total of 16 teams have been slotted under 2 segments, where the top 8 of the Division ‘A’1 segment will compete for the Cup Championship, while the 2 bottom seed teams from the top segment and the top 6 teams from the Division ‘A’2 segment will vie for the Plate Championship. The curtain raiser of Round II will be a Plate Championship match between hometown rivals Kingswood College and Sumangala College to be played on April 20 at Nittawela. The Cup Championship segment will kick off on April 22 with a crunching match between S. Thomas’ College and Isipathana College at Mt. Lavinia. All games of the Cup Championship are expected to be thrillers as St. Joseph’s College, the only unbeaten team from Round I, will have to keep their record intact, if they are eyeing the League title. Defending champions Royal College, however, will make sure not to repeat the same mistake they made against St. Peter’s College in Round I. With matches being scheduled as cross fixtures, teams will face opponents from the other group in Round II, making the games more exciting, as each game will be crucial for all the teams. The matches will be played through 5 weekends before all 32 matches from both segments come to a close by May 17. 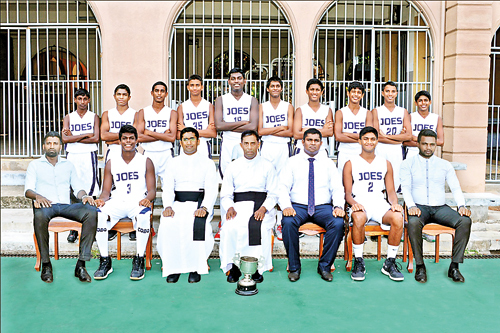 St. Joseph's College, Colombo emerged champions at the Western Province National Schools Under-17 Basketball championship 2019 at the St. Joesph's College Basketball Courts on April 7. St. Joseph's College defeated St. Anthony's College, Wattala, 41-31 in the finals. On their way to the finals the Joes defeated St. Benedict's College, Kotahena, 49-40 in the quarterfinals and overcame Lyceum International School, Nugegoda, 41-31 in the semifinals.